Little Caesars Arena in The District Detroit serves as the home of the Detroit Red Wings, Detroit Pistons and countless other sports, entertainment and community events. Rich with the tradition of the Original Six™ Detroit Red Wings and Detroit's incredible musical heritage, the arena also features state-of-the-art technology, fan amenities, and active community spaces like the Via, the BELFOR Training Center, and the Chevrolet Plaza. If you are interested in a ticket package for the Red Wings or Pistons for the Inaugural Season at Little Caesars Arena, please CLICK HERE. To help our guests become acquainted with Little Caesars Arena and answer many frequently asked questions, Olympia Entertainment has launched an informative video series called "Looking Into Little Caesars Arena." This series, which will cover arena topics like parking, wayfinding, technology and more, will be released over the next few weeks on this page and through the Red Wings' and Little Caesars Arena's social media channels. Olympia Development operates 32 parking facilities within The District Detroit, all within a 10-minute walk to Little Caesars Arena. Little Caesars Arena is partnering with ParkWhiz to help you find the best parking for games and events in The District Detroit. ParkWhiz is an e-parking service that allows users to book a guaranteed parking space before reaching their destination. Book your parking spot today by clicking here or select an option on the map below. Parking hours differ based on the individual garage or surface lot, and based on the event. Parking facilities open a minimum of three hours before the scheduled event and are open two hours after the conclusion of the event. Parking capacities are subject to change based on the size and type of the event. As you approach Little Caesars Arena, there will be highway, street level and variable message signs directing you to parking lot options. To ensure safe and efficient travel throughout Downtown Detroit, please follow the direction of the traffic and parking staff. Illegal parking on area roadways, medians and hooded meters is prohibited. Violators will be ticketed by local law enforcement and/or towed. Oversized vehicles are not permitted in Olympia Development lots. It is recommended that ticket holders give themselves plenty of time for arrival to our events. Ticket holders are encouraged to enter the arena early to become familiar with the routes to their seats, restroom locations, concession stands, retail locations, etc. 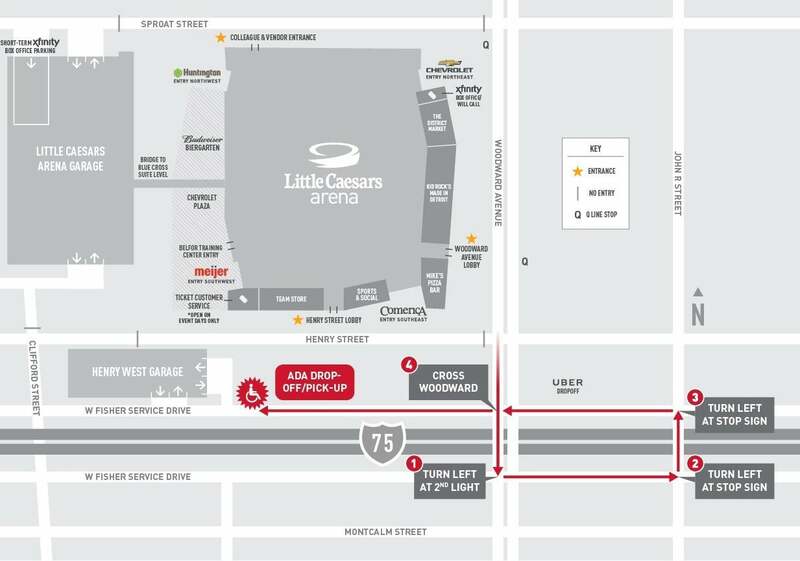 The designated ADA Drop Off / Pick Up location for Little Caesars Arena guests is along the West Fisher Service Drive near Park Street. Guests can enter the building through the Meijer Southwest Entrance, and request wheelchair assistance from our Guest Relations team if needed. Disabled parking spots are also available in the Little Caesars Arena Garage, as well as the surrounding Olympia-owned parking lots. These spots are available on a first-come, first served basis, at the going event rate. CLICK HERE to view map. Experience the brand-new, state-of-the-art facility and see several behind-the-scenes areas by booking a tour today. Please CLICK HERE for more information. The Little Caesars Arena XFINITY Box Office is off Woodward Avenue, adjacent to the Chevrolet Entry Northeast. Free 20 minute parking for the XFINITY Box Office will be located on the street level of the Little Caesars Arena garage located at 165 Sproat. Parking will only be valid during XFINITY Box Office hours, excluding event times. Sunday: Open only on game and event days from 9:30am – 30 minutes before end of event. Event Days: 9:30 a.m. through 30 minutes before the event conclusion. Please note: Venue box offices will be closed in observance of the following holidays: New Years Day; Martin Luther King Day; Memorial Day; Independence Day; Labor Day; Thanksgiving Day; the day after Thanksgiving; Christmas Eve; Christmas Day. If there is an event on one of the listed holidays, please see the respective venue event day box office hours. Copyright © 2010-2019 Olympia Entertainment ® All Rights Reserved.